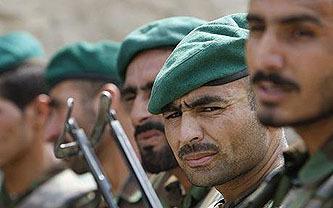 If we left Afghanistan tomorrow, lock stock and barrel, two things would happen to the security forces. The first would be the ANA and ANP would completely evaporate as functioning institutions in much of the country, probably in a matter of days if not hours. They are still very much artificial constructs that we’ve imposed, and wholly dependent on our technology for their survival so long as they continue to use the tactics we’ve taught them. The second would be that the revitalized Northern Alliance and other forces that the ANA replaced would resume doing exactly the kinds of nifty hit-and-run things, to protect their enclaves, that Malevich is talking about. Because that IS how they fight, when left alone. To get the current Afghan army to do those things, you’re talking basically starting over at this point… or taking a good chunk of the country and letting them run it with a bare minimum of Western troop support, operating almost covertly within their ranks. It would have to be a low-risk area of the country, because if you did that right now in the South the insurgents would eat them for lunch, but in another part of the country it might be possible. Here’s what we’ve trained the ANA to do, instead. They can in some circumstances involving the locals be useful interfaces for our forces. They can hold and defend fixed locations and the immediate environs. They can force-multiply small Western dets, which would be a lot more useful if there weren’t more westerners in the south than ANA right now. They can do effective IED sweeps daily, and other such activities where the cumulative risk to Western troops would simply be too high. Umm, that’s about it. Maybe Bruce is too pessmistic. Who knows? But this is the kind of conversation I’d sure like to see our top officers in Afghanistan forced to have. Because what Bruce is saying, essentially, is that the last eight years have been squandered. Actually, worse than squandered: thanks to us, the Afghans are less capable of disrupting the Taliban than they were in 2002. At least, that’s how it sounds to me. In the same way that a lot of foreign aid projects in the 50s and 60s were wasted efforts because they couldn’t be sustained by local populations, our military training in Afghanistan has been wasted because it’s light years beyond what Afghans are able to sustain on their own. They can act as gofers for NATO units, but that’s about it. So here are a few questions: Is it really true that after eight years the Afghan army is no more capable than it was in 2002? Is it really true that our current training regimen is completely counterproductive? Would we better off leaving and just allowing the Northern Alliance to do its thing with arms and materiel that we provide? If we start from scratch instead, how many years will it take to turn things around? Petraeus and McChrystal never have to address blunt questions like this — at least, not in public — but it might be time for that to start. I’m a little weary of the happy talk.